Fish intake is positively associated with breast cancer incidence rate published in the November 2003 issue of the Journal of Nutrition by Connie Stripp found the risk of a woman developing breast cancer increases when she eats more fish. The investigation studied 23,693 postmenopausal women, average age of 57 years. For each 25 grams (less than an ounce) of lean fish consumed daily there was a 13% increase in risk of breast cancer. For fatty fish the increase was 11% for each 25 grams. 1) Fish and fish fat are known to suppress our cancer-fighting immune system. 2) Fish is contaminated with cancer-causing environmental chemicals (like heavy metals and pesticides). 3) Cooking fish produces powerful carcinogens called heterocyclic amines. 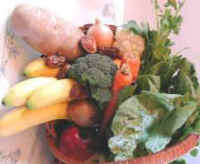 For supporting research and more reasons to avoid fish in your health-supporting diet see my February 2003 Newsletter. Stripp C, Overvad K, Christensen J, Thomsen BL, Olsen A, Moller S, Tjonneland A. Fish intake is positively associated with breast cancer incidence rate. J Nutr. 2003 Nov;133(11):3664-9.